Today is the three year anniversary of losing my grandson to Trisomy 18. When it happened, I knew the experience would somehow translate into my writing. I just didn't know it would turn into a full length novel. It took me awhile, but I was finally able to put all of my thoughts and feelings into the written word. After writing I'M WITH YOU, I felt expunged of my overwhelming feelings of grief. For that reason, I'm glad I wrote it. I'm also glad I was able to spread the word about Trisomy 18, a devastating condition. What I love the most of anything is that my grandson is forever memorialized in this book. 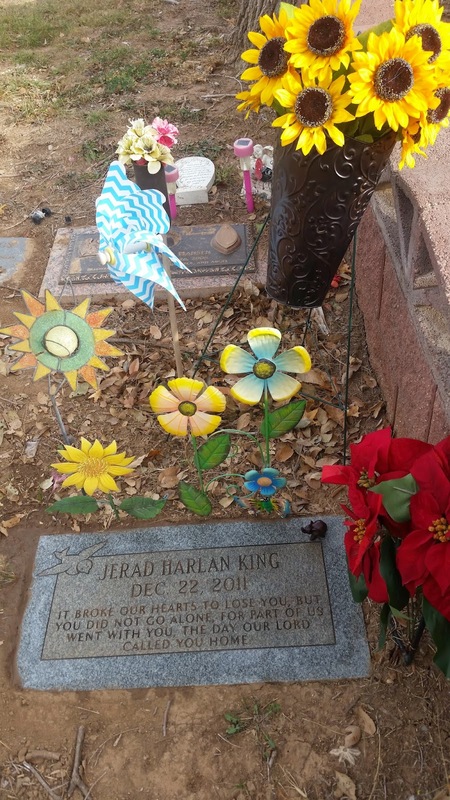 We visited Jerad yesterday and placed sunflowers on his grave. We love you, Jerad, and you will never, ever be forgotten. Taylor, I am so sorry. I have three grandkids, I can't even imagine the pain. I am crying for you. Thank you, Rita. I appreciate your kind words. My daughter now has a beautiful baby boy who is 16 months old. He doesn't replace losing Jerad, but he does bring her--and all of us--so much joy. Thanks, Christy. My prayers are with you and yours during this holiday season also. Words have healing power, don't they? I'm glad you shared Jared's story through your writing. That novel touched me so much and I have reread it a couple times and feel glad I know about Trisomy 18 now. I'm just glad I was able to get a glimpse into the grief a Mom experiences after losing her baby by reading I'm with You. That means a lot to me, Charissa. I hoped that writing I'm With You would help people understand the complicated feelings of grief that come with baby loss. To know that I achieved that goal is important to me. So, thank you for expressing that to me. I am so sorry for your loss :( I am glad that writing was able to help you cope. I am sure that he is looking down from Heaven, so proud of your book. God bless you and your family during the anniversary of his death. P.S. That is such a beautiful inscription on his tombstone. Thank you for your kind thoughts, Natalie. Writing this book made Jerad real, never to be forgotten. It is proof that he lived, even if it was for such a short time. It's a tough day for my daughter, but I will pass on your well wishes to her. She has not been able to read the entire book, but gave me permission to publish it. I'm thankful she allowed me to share her story. Thanks again. Of course :) And that was very wonderful of your daughter to allow you to publish it, help you find peace. You obviously have a good relationship with her. I hope that the holidays were nice for you and your family. My thoughts are with you and yours. Your daughter has a lot of strength and I hope you enjoy the good of the holiday season!! Thank you so much, Sherry. I appreciate your kind words. Merry Christmas!